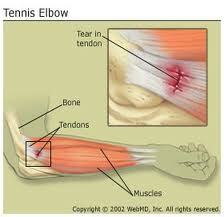 Lateral epicondylitis, or tennis elbow, is a fairly common elbow disorder. Patients who have lateral epicondylitis usually present with pain at the lateral aspect of the elbow, elbow over a bony prominence termed the lateral epicondyle, that often radiates down the forearm, causing muscular tenderness and functional difficulties with tasks involving gripping. (ACC, 2009). Occasionally, the patient can recall a specific injury area, but often the pain is gradual and insidious. They often report weakness in their grip strength or difficulty carrying items in their hand (Whaley, A.L., Baker, C.L, 2004). Pain occurs with activities such as grasping, pushing, pulling, lifting, shaking hands, and turning doorknobs. As the processes progresses the pain may occur with limited activities or even at rest (American Association for Hand Surgery). Lateral epicondylitis most often occurs related to overuse. Any activity that over stresses the involved tendon, the extensor carpi radialis brevis, can cause the disorder. These activities include repetitive work, like certain manufacturing industries where forceful and repetitive movements are required (eg. meat processing workers, plumbing, painting, weaving), gardening, tennis). According to Nirschl, 10% to 50% of people who regularly play tennis will develop the condition at some time during their careers. Lateral epicondilytis can also be related to direct trauma to the outside portion of the elbow. It is believed that overuse or trauma causes a microscopic rupture in the tendon of the extensor carpi radialis brevis muscle, which leads to degeneration. Although lateral epicondylitis is termed a tendonitis (inflammation of the tendon), there are few inflammatory changes in the tissue and therefore it is considered more of a mechanical problem with degeneration of the tendon (American Association for Hand Surgery). Aging appears to make these tendons more prone to breakdown, affecting people from 40 to 60 years old, both males and females.